Photo by Kim North Wheeling Central shortstop Avery Lee avoids Barnesville’s Aaron Marovich as he turns a double play during Saturday’s championship game of the Shamrock Classic at Memorial Park. The Shamrocks won 10-0 in 6 innings. BARNESVILLE — Barnesville continued its prowess at the plate Saturday, defeating Monroe Central and Wheeling Central by identical 10-0 scores to claim its Shamrock Diamond Classic at Memorial Park. The Shamrocks outhit their opponants by a combined 22-6 count. Jagger Jefferis fanned 10 in the nightcap win over Wheeling Central and Hunter Carpenter struck out eight against Monroe Central. Ayden Hannahs singled, doubled and drove in two and Riley Tubaugh added two hits and two RBI for the Shamrocks (11-0). 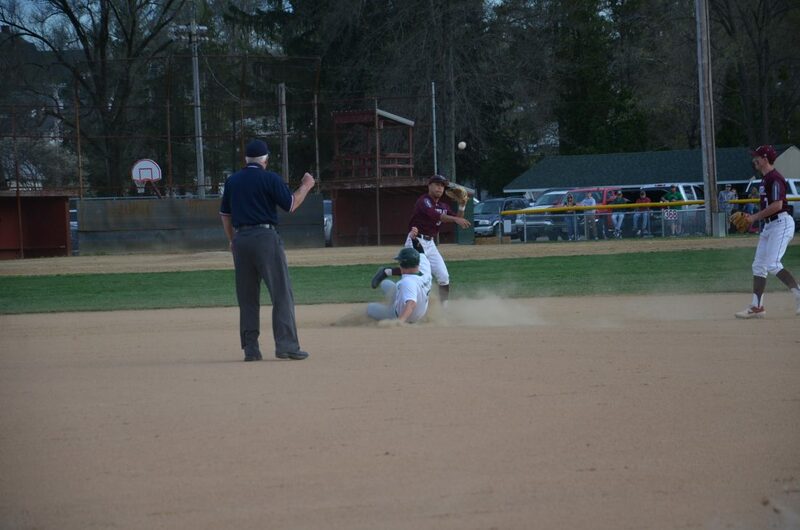 Adam Murray had a double for the Maroon Knights (10-5). 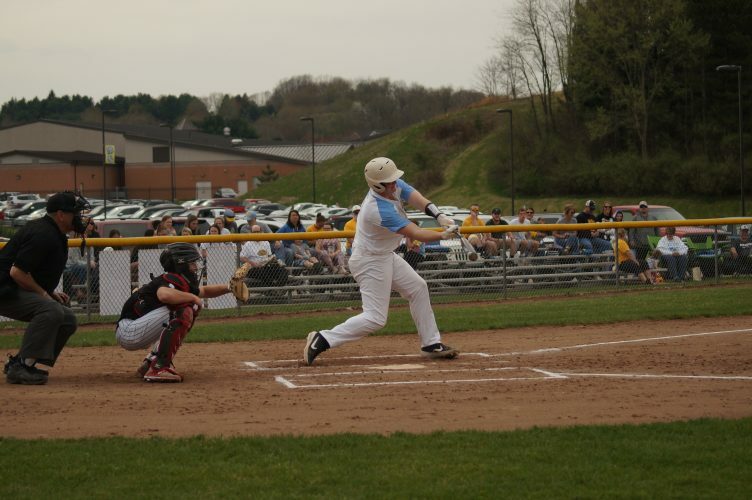 In a 12-4 win over Buckeye Local, Wheeling Central was led by Kyle Newmeyer’s three hits and four RBI, while Dominic Pompei laced three hits, Angelo Gentile roped a triple, two singles and a RBI and Sonny Peluchette added a single and a double. SHADYSIDE — Freshman Korey Beckett scattered three singles and struck out six in a Shadyside (11-2) victory. Kelly Hendershot drove in three runs, two coming on a single in the sixth. Anthony Coggins finished with two singles, a pair of doubles and two runs batted in. Martins Ferry (6-3) lone run came Collin Snedeker scored on a Shadyside error. TORONTO — Union Local went to extra innings and scored two runs in the eighth in earning a victory against Toronto. Dakota Hess drove in two runs, Ayden Smirola had a double, triple and a RBI; while Hunter McCort (two singles, RBI) and Cody Morrison (three singles) also helped lead the Jets. WHEELING — Jacob Shia, Nolan Mattern and Bryce Bauer each had RBI doubles in a Game 1 victory against Warren. In Game 2, though, the Patriots gave up 15 runs — five in the top of the seventh — as they were stunned by the Warriors. Jason Gwynn and Isaac Hines each hit two singles, a double and drove in three. WEIRTON — Madonna freshman Matt Amaismeier threw a five-inning perfect game in the opener, striking out 10 of the 15 batters he faced. Jake McKay won the second contest. He walked one and struck out eight over five innings. Offensively, Luke Beatty finished the day with four singles, a double and eight RBIs combined. Dom Mazur had a pair of doubles, singles and four runs batted in. Gavin Dietrich produced two doubles, three singles, three walks and an RBI. Christian Ridgway had four singles and four RBI. RICHMOND — Brennan Scott lifted the Edison baseball team with a walk-off single to lift his team past South Range. Scott finished with a pair of singles overall. George Ash shined on the mound and at the plate. 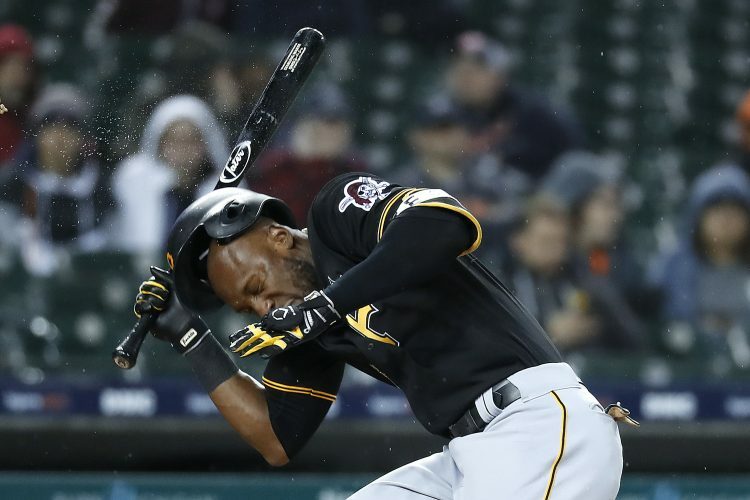 He singled twice and drove home a run, while picking up the victory in the complete-game effort, with five walks and three strikeouts. Ryan Higgs had two RBI, while Andrew Kinney doubled. Anthony Sinicropi tripld and walked twice. Alec McBane also tripled. STEUBENVILLE — Cambridge swept a pair of games over John Marshall and host Steubenville, no-hitting the Monarchs. JM’s Josh Schramm plated two runs on a single and a double, Derek Black provided two hits and two RBI and Reid Wiley added a single, a double and a RBI for the Monarchs (7-13). Calvin Bickerstaff had a single, a triple and three RBI in Big Red’s win over the Monarchs. ST. CLAIRSVILLE — St. Clairsville was dominant in sweep of Buckeye Local, outscoring the Panthers 40-1 and outhitting them 42-7 during a doubleheader sweep. STEUBENVILLE — Big Red split a tri match at the Franciscan University of Steubenville softball field, defeating Wheeling Central and falling to Poland. 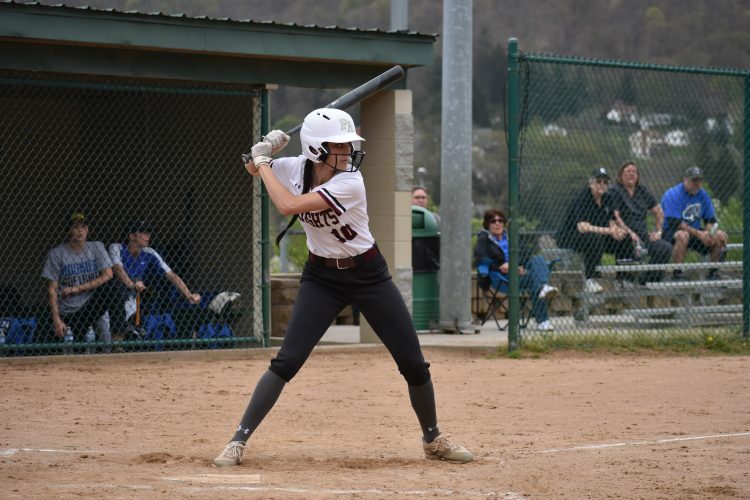 Against Wheeling Central, Sammi Cucarese had three hits and four RBI, while Mary Marshall had a home run and four RBI. Ally Davidson and Chloe Vogrin each hit home runs for the Maroon Knights. LISBON — Bellaire (9-9) picked up a pair of crucial victories in its OVAC Tournament chase. In the opener, Natalie Stoner was impressive in the circle and at the plate. She pitched a complete game, two hitter with seven strikeouts. She also had a double, home run and two RBI. Kaitlyn Kosky had two singles and three RBI. BELLAIRE — Regan Hanlon struck out 10 in a three-hitter as Barnesville took Game 1 of a doubleheader split. Jessica Johnson hit a single and three doubles on the day for the Shamrocks (8-9). The Irish (8-5) was paced by Shaylyn Horvath with a single, double, home run and three RBI on the day. Jayden Lowe struck out 15 in a Game 1 losing effort, but helped her cause with a solo home run. 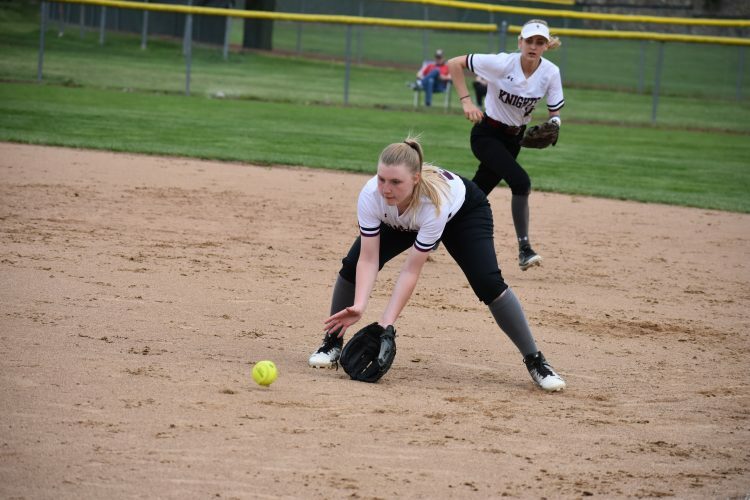 WHEELING — Maleahea Misch struck out eight in leading Brooke past Magnolia. Landyn Haynes hit a double with two RBI, Megan Cross had two singles with a RBI, and Brooke Ohler’s single drove in another for the Bruins (10-7). Carli Julio had two doubles. Lindsay Whiteman knocked in the lone run for the Blue Eagles (10-3). Paige Brill added a double. SISTERSVILLE — Tyler Consolidated (5-10) bounced back after losing the first game to claim the nightcap of a doubleheader. Madison De’Vaughn belted a grand slam and supplied a single in the Silver Knights’ win and teammate JoLee Walton doubled, singled twice and drove in a run. MARTINS FERRY — Weir is back over the .500 mark after a doubleheader sweep at Martins Ferry. The Red Riders (10-9) won the first game as Liv Rosnick went the distance and picked up a victory, striking out eight and walking one in the process. Offensively, she produced singles and three RBI. In the second game, Sam Kaczmarek pitched the first five innings and got the victory. She struck out four, walked none and all four runs she allowed were unearned. TORONTO — Toronto swept a doubleheader against Southern behind Jamie Anderson’s effort. She was the winning pitcher in both games, pitching the final two innings in releif in the first game with three strikeouts for the win, and going the distance in the second with eight punchouts.